We all have our own ways of coping and managing our feelings, some methods healthier than others. 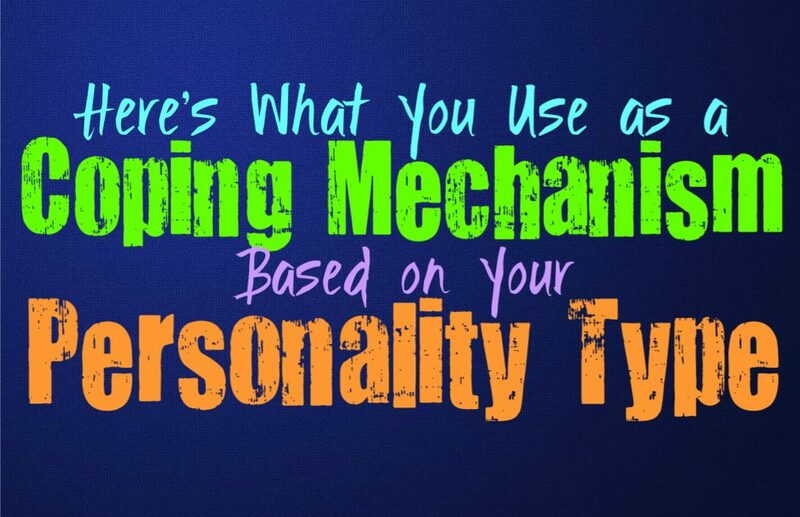 Here are some coping mechanisms that each personality type is most likely to use. INFJs can sometimes cope with their pain and trauma by internalizing their feelings. They often try to manage it by pushing it aside and focusing on the needs of others instead. INFs have a hard time facing these feelings sometimes, not always feeling at ease dealing with their own pain. They might become a bit codependent towards someone they love, and can utilize this as a means of feeling better about what they are going through. Facing the pain can be difficult for the INFJ, especially since they want to appear strong and capable to others. ENFJs often have a hard time really dealing with their inner emotions, sometimes using distractions to cope. They often use their empathetic and giving nature as a way to cope with their struggles. When the ENF is having a hard time with something persona, they often try to work on helping others instead of helping themselves. They will focus on the needs of their loved ones, burying themselves in work and chores. ENFJs don’t necessarily do this on purpose, caring for others just comes naturally for them and often brings them comfort and joy. INFPs who are using unhealthy coping mechanisms can sometimes deflect what they are going through by projecting it onto someone else. This is not something they likely do intentionally, they simply want to find a way to get the pressure off of them. When the INFP is feeling overwhelmed with grief or pain from a past trauma, it can be challenging to really overcome these emotions, especially if people do not allow it. Most of the time the INFP coping mechanisms can be healthy, and simply revolve around taking time for themselves in order to process things on their own terms. ENFPs can often use humor as a way to cope or even deflect from what they are feeling. They can sometimes struggle to face these overwhelming feelings of grief, especially if they have been hurt a lot in the past. An ENFP who hasn’t been through consistent heartache and trauma, often knows how to properly cope with their emotions. They will simply strive to understand what they are feeling, focusing inward instead of trying to find other means of feeling better. Some ENFPs who are struggling to find ways to cope, but simply continue bouncing around to different adventures and hobbies, but they will even do this with people. INTJs can sometimes bury themselves in work in order to cope with or handle something they are feeling. They often use research as a means of dealing with things, but this isn’t always the healthiest way to actually cope. If the INTJ is struggling with something internally, they can have a hard time actually facing their emotions. They often try to deflect and even bury these feelings inside, not really knowing how to handle them without using logic or reason. ENTJs can often use work as a coping mechanism, burying themselves in the things that keep them busy. They also use their accomplishments as a way to distract themselves from any emotional struggles they might encounter. ENTJs want to feel proud of themselves, and working hard in order to achieve their goals is often how they strive to do this. They use their efficiency and their ability to advance in life, as a way to cope with anything that might be giving them trouble emotionally. INTPs often try to logic away their feelings and any negative experiences they encounter in life. Instead of actually dealing with their inner emotions, INTPs often find themselves attempting to understand them in a logical manner. Feelings cannot always be understood, nor can they be reasoned away with information and facts. The INTP will attempt this regardless, and will often try to make themselves understand their feelings in a logical manner, or else they will simply bury them. ENTPs often use humor as a way to cope or deflect from their problems or emotions. ENTPs don’t find it easy to really deal with their inner feelings, struggling to even understand them most of the time. When the ENTP is having a hard time coping they can often use humor as a way to cope and move on. They make jokes about their feelings and pain, and simply pass it off as perfectly okay. ENTPs can also use distractions to cope, searching for different hobbies and opportunities to keep them occupied. ISTJs often use facts and logic as a way to deflect away from their negative emotions. ISTJs don’t find it easy to deal with their emotional problems, finding that practical problems are much easier to face. They often try to deal with their problems by finding a practical solution, which does not always work when it comes to emotions. ISTJs don’t do this intentionally, they simple don’t readily understand their own emotions or the emotions of others. ESTJs don’t often find it easy to deal with their emotional needs, which can make for some unhealthy coping mechanisms. When the ESTJ is struggle to overcome something internally, they often try to push those negative emotions aside. Instead of dealing with the emotions, they will try to solve these problems in a more practical manner. ESTJs are efficient people and often having any emotional turmoil can feel like a weakness to them. ISFJs often use others as a way to cope or even ignore their own struggles or pain. ISFJs want to appear strong and stable most of the time, and so they can sometimes neglect their own feelings. Instead of really focusing on themselves they might turn this energy towards someone they love. This can be a negative thing for the ISFJ, since they can push themselves too hard and end up feeling overwhelmed and emotionally drained. ESFs can often use their empathy and love for others as a way to cope with their own struggles. Instead of really facing their inner emotions ESFJs can often distract themselves by focusing on others. They can sometimes struggle to really deal with their own feelings, finding it much easier to take care of the people in their lives. ESFJs often try to heal themselves by healing others- and while sometimes this helps, it can often lead to them neglecting their own needs for too long. ISTPs often bury their emotions, and try to cope by simply ignoring those inner feelings. ISTPs don’t really deal with their feelings well when they are younger, and might even struggle with this as they get older. It can be challenging for them to understand emotions, especially their own. Instead of accepting how they are feeling, ISTPs often try to use logic and research as a way to deflect from these inner emotions. ESTPs can often execute some less than healthy coping mechanisms, searching for a bit of chaos to help them through. ESTPs seek out adventure and sometimes can be a bit self-destructive when they are having a hard time. They don’t always do this intentionally, they simply cannot seem to sit still and need to constantly search out things to keep them occupied and entertained. ISFPs can often sift through their own emotions fairly well, taking time on their own to figure them out. When these emotions do feel a bit too overwhelming, the ISFP can become a more reckless version of themselves. Instead of trying to figure out their feelings and wok through them, they realize that they need to find something to distract them from what is going on. They will likely jump from one thing to the next, searching for whatever is the most exciting. ESFPs can often jump into some unhealthy coping mechanisms when they are struggling with something internally. When ESFPs are feeling overwhelmed by something they often seek out adventure and excitement in order to keep themselves distracted. They sometimes spend a lot of money, or do things that appear a bit reckless. They are simply searching for ways to keep their mind off of the negative emotions, wanting to find anything that will bring them joy instead.